We were well chuffed when Tanya's email showed up on the cyber radar. Yet another Portland view of their blossoming bike culture, this time through Tanya's eyes. miss a lot of the practical and humane ways of living in Northern Europe as a whole. Still, someone has to help spread the dream here in the USA. I am now the CEO for a corporate wellness company - RecessWellness.com. I just think that going to gym to "workout" or donning a bunch of crazy cycle gear is just silliness. I even own a Christiania trike that I use for hauling gear. I have been trying to get regular people in Portland offices to just get on their bikes and stop making such a big deal of everything. People just about have a coronary when they find out I bike around in a suit and heels in the rain! What a wonderful and inspiring email to recieve. Thanks for thinking of us, Tanya! We wish you an eternal tailwind and best of luck with your quest. What a cool, blue bike you have, too. www.point83.com - Unfortunetely the calendar is sold out I think but it is great I got one this year after missing it last year. Some hot ladies. Another great calendar is at www.muddbunnies.com - Its a mountainbike girl group calendar. I am totally with Tanya on cycling garb. 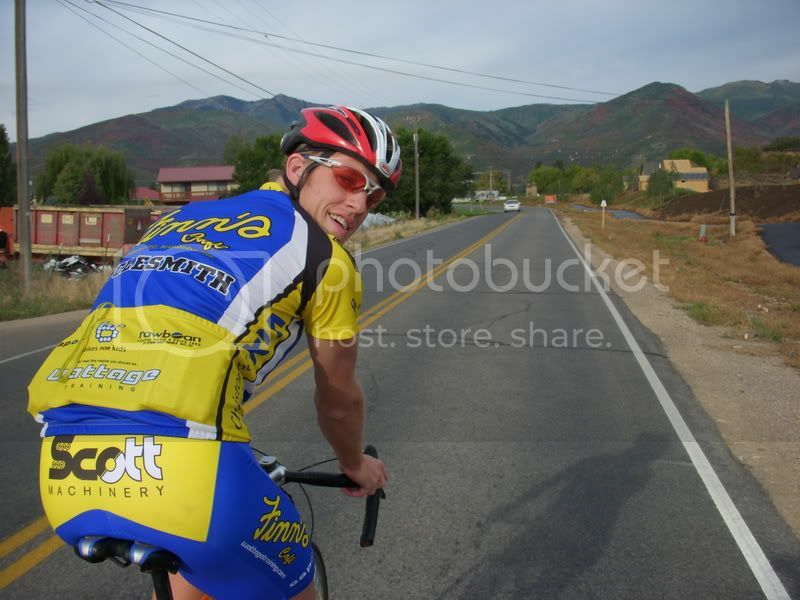 I work for a large bicycle store in Texas and lead a ride on Saturday mornings in casual clothes. My manager said "Everyone looks like there in the Tour de France, you look like you're going to a Jimmy Buffet concert"! the first shot is a self-portrait... not of me, of course, but of the submitter, Tanya. i agree, mark. when cycling becomes 'normal' in a society, people just wear normal clothes. like millions of city-dwellers in Europe. Awesome post, and way to go Tanya! Tanya- I don't know you, but already I'm a big fan! 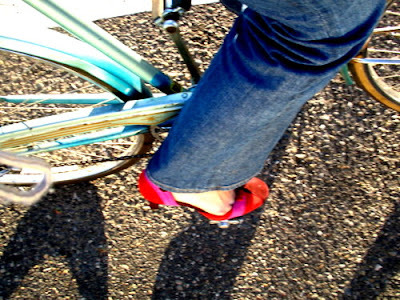 You've got style, chutzpah, and hopefully a really great ride today in your pumps. Zakalicious- Yet another inspirational post--- thanks. If i had unlimited resources i would single-handedly transform portland into a cycling paradise. you people are just so really cool. Tanya, how come I've never seen those pink shoes?! Probably because I would find some sneaky way to take them from you. I'm a client and friend of Tanya's. She truly bikes everywhere and manages to look good and smell good too. I'll have to ask her about how she manages that. 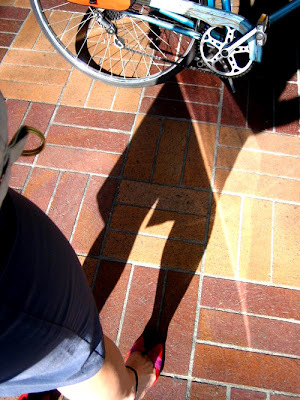 When I bike to work, when the weather is nice (okay, okay, I'm one of those fair weather cyclists), I wear work clothes: dress, pearls, but with bike shorts and shoes. I'm a long way from doing it in heels. I also have to deal with 20 minutes worth of glowing (sweating) as my ride catches up with me. It's fine if I don't have a meeting I'm going to right away. I am a bit surprised at what Tanya says about people's reactions to her commuting by bike in suits here in Portland. I recently moved here from New York City (where lots of girls in lovely clothes ride beautiful bikes) and find that Portland is the bike-friendliest place I've ever been in the US. I see people in suits, women in work clothes, and people dressed all sorts of ways commuting by bike here. And unless I'm on my way to the gym, I'm always nicely dressed on my bike, too. That part of the bike culture in Portland is one of the things I love about my new city! what about minneapolis minnesota in the USA? (or 'iceland' whatever you prefer) we ride thru it all and even like it. about fashion.. since many of us claim to be of norwegian heritage... "there is no such thing as bad weather only improper clothing". bike trondhiem, the bike escalator is weak but unique. .
sorry i couldn't let it rest like this ... on norwegians populating a state...2 things you don't want to see, sausage being made and norwegians making love. Andrew - do we know each other? Ha ha. I have lived car free and biked in Minneapolis, MN AND Iceland. And in heels (except for in the winter in Mpls - then I looked like a pile of blankets on wheels). As far as the comment about the Portland bike scene goes, yes, the bike scene is good but don't fool yourself into thinking we don't have a long way to go. Most of the folks I meet through work are not converts (Jackie being an exception)...yet. I think this site could change their mind. Patrick - I am surprised we haven't already collided. I am in NE near Pix! Where you at?